Altitude range: 0–2100 metres above sea level. Habitat and ecology: This species is very common in savanna, open woodland and scrub, forest clearings and along roadsides. It often grows in uniform populations. Description: Drimia altissima (L.f.) Ker-Gawl. (= Urginea altissima, Idothea altissima, Ornithogalum altissimum) is a perennial bulbous plant producing a tall flowering stem followed by a rosette of leaves about 20-50 cm long. As the species name implies, this is one of the tallest among all African geophytes. The plants are often found in colonies and the large bulbs lie just below the surface of the soil. In this species, the flowering stem is exceptionally long, reaching 2 m and usually flowering before the leaves. The white flowers have a green streak down the middle of each petal and the subtended spurred bracts are clearly visible in young flowers. The species is variable, at least three forms occuring in W. Africa: large, medium and small sized plants. Derivation of specific name: Latin altissima: very tall. Bulb: Very large, globose to pear shaped and ca.8-12(-15) cm in diameter, often half above ground, with tough, white, overlapping fleshy scales and a brown outer tunic of dead scales. Leaves: Lanceolate, light green, glabrous, (20-)30-45(-50) cm long, (2-)5-7.5 cm broad. Inflorescence: The inflorescence is a more or less dense, cylindrical, raceme 60-90 cm long, 3-4.5 cm in diameter with up to 700 flowers. Scape erect, usually tall and robust, sometimes 0.9-1,2 m long, up to 1 cm. in diameter light glaucous green. Pedicels spreading or patent, (8-)12-25(-30) mm long. Bracts small, lanceolate, bent up to 14 mm long and obscurely spurred below the middle ( spur up to 3 mm long). Like Drimia sanguinea the inflorescences appear before the leaves. Flowers: Perianth campanulate, 18 mm long; segments (tepals) free or united for up to 2 mm, oblanceolate-oblong, 5–12 mm long, white or greenish white, with a a green or dull purple-brown keel outside, spreading. Stamens shorter than the perianth. Filaments linear to very narrowly triangular, free or basally united to tepals slightly flattened, free part 4-7 mm. Anthers oblong, 2 mm long; style 4 mm long. Ovary ovoid, 2–5 mm long; style about as long as ovary. Flowers opening in the morning, usually closing by midday. Fruits (capsules): Three chambered, globose or subglobose, obtusely trigonous, sometimes with an emarginate apex, 8–15 mm long, 9-15 mm. in diameter. Young fruits green. Seeds: Semicircular 5–8 mm long glossy, black, flattened and winged. Seeds then ripen during the early part of the rainy season. 7) Hyde, M.A., Wursten, B.T., Ballings, P. & Coates Palgrave, M. (2015). "Flora of Zimbabwe: Species information: Drimia altissima." 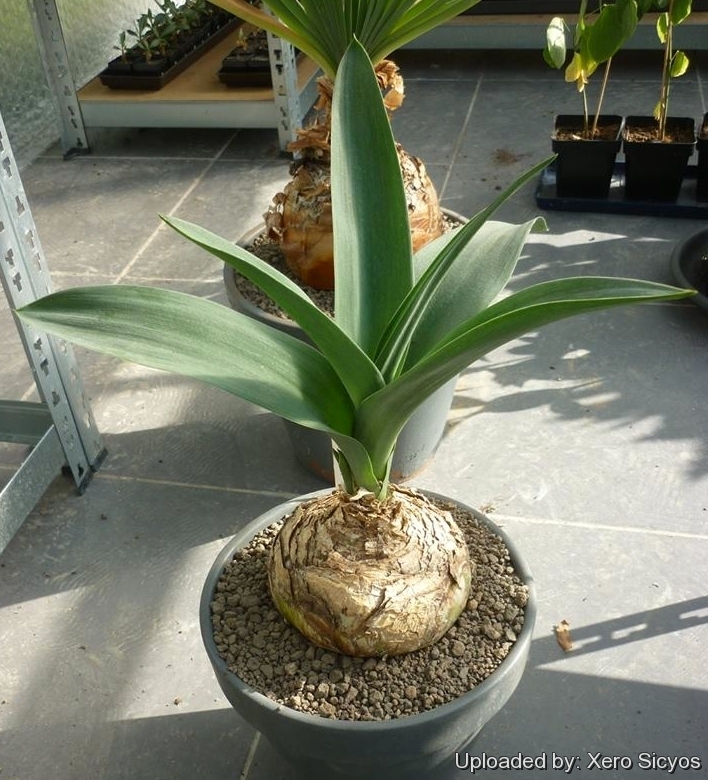 Cultivation and Propagation: Although usually grown only by specialist bulb-grower Drimia altissima presents no great difficulty in cultivation. The ease of culture make it an invaluable subject for the impassioned bulb-growers. Traditional medicine: The drug, known in commerce as the white squill, consists of the dried sliced bulbs of Drimia maritima from which the membraneous outer scales have been removed. Squill has a long history of use in medicine: The earlier Greek and Egyptian physicians used various forms of squill as therapeutic agents. An oxymel of squills was part of an Arabic prescription, and a vinegar of squill was used by Dioscorides, the Greek physician. Squill occurs in two varieties, the white and the red squill. The white variety is employed in medicine, and the red squill is used mainly for the preparation of rat poison. The African squills Drimia indica (Roxb.) Jessop. and Drimia altissima are used in folk medicine in Nigeria but are not official pharmaceutical products or articles of international trade. They have with a bitter and acrid taste and may have a Digitalis-like action (cardiotonic properties).. The drug is very hygroscopic, and if powdered drug is not well stored, it turns into a solid moldy mass. Warning: The bulb is extremely poisonous. The juice is caustic, and poisonous to rabbits. Propagation: By seed or rarely by division of bulbs. Offsets are rather slow to form (if ever), and are best separated from the mother bulb straight after flowering, just as the new leaves begin to develop. Seeds form readily and should be harvested and sown as soon as they can be easily removed from the fleshy berries. Seeds may take up to two months before the first leaf appears above ground, and a further four to five years to flower for the first time.